In order to make an orb, you'll need some battery operated fairy lights, speaker wire, electrical tape, and a functional arm to spin it with. I recommend getting white LEDs because you can change the colors of them at any time by taping some Roscolux colored gels over them. Once you've got some fairy lights, cut the two wires and extend them using speaker wire. Watch this video tutorial by TxPilot to see this process being done in real time. 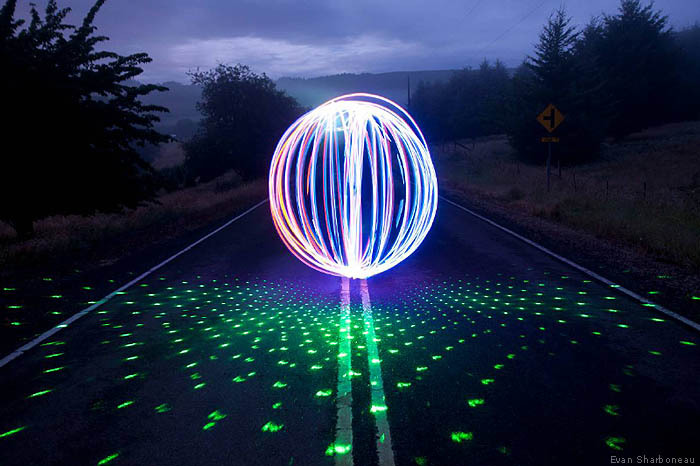 Now that you have your orb tool, you are ready to start taking the light painting photo. Set your camera up on a tripod and use manual mode with auto-focusing off. The specific camera settings you need to use will always vary - it all depends on how bright the fairy lights are in relation to the environment they are being photographed in. Sometimes I take one photograph with the camera settings adjusted for the landscape and then another separate photograph with the settings adjusted for the orb and then combine them in Photoshop by placing both of the images in a Photoshop document as layers, and then selecting "Lighten" or "Screen" as the Blending Mode on the top layer. This was photographed in my front yard at night. With a 30 second exposure taking place, I used a large flashlight with large colored gels over it to light paint the tree, foreground, and even background. After that, I combined the photos in Photoshop using Lighten as the blending mode for all of the layers. This was photographed at 4:08 AM on July 15th, 2011. If you wake up early enough to catch the early dawn or late dusk light, you can get both the orb and the environment properly exposed in the same shot without the need to combine the shots in Photoshop. Your next best bet after dawn/dusk light is to use moonlight. A full moon on a clear, cloudless night works best. You can literally capture photos that look like they were taken in the day time if you use the right camera settings to make the picture brighter (lengthening the shutter speed, raising the ISO value, and/or lowering the F Number). There are a few more orb photos I made that can be found on the Photo Extremist Facebook page. 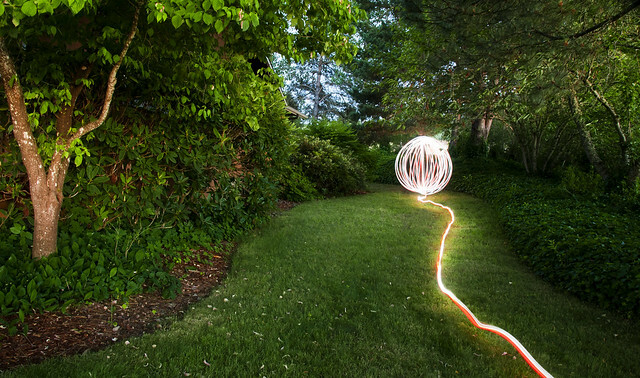 And of course, for a collection of orbs created by light painters on Flickr, check out the Orbs group. Shout outs to TCB for making the original video that showed me how to do this and TxPilot for making the orb tool tutorial. Awesome tutorial. For the last pic I guess a flexible Arc with leds on it…. Thanks. That’s what other people were guessing too (on youtube) but it actually was a hula hoop with LEDs attached around it – someone got it already! Greetings, How dothe Mystery orbs.. Could these orbs that displaying discontinuity of the light…, could they be made with a similar xmas light system, set to one color (yellow), AND set to run in flashing mode? Ahhh. I just saw the answer. What are fairy lights? Hi Evan, hope this finds you happy and well, great tutorial, can’t wait for your videos to come out, I want them now, yours Tony. One suggestion, rather than cut the wires and extended them just leave the battery pack at the end with the taped lights. Tie/tape a rope or cable around the battery pack and you are good to go. It will also give you the weight you want at the end. COOOOOLLL !!!! Thank you ,great tutorial ! I Used a Yo-Yo…. Lots of good weight on the bottom… Worked great! thanks for the ideas! I’m going to try spinning an umbrella next. I love your long exposure work! Great tutorial, I was having trouble with my orbs but your tutorial has taught me a lot of new tricks. Thanks for sharing. Last night i tried to pass an order but being on morphine ( bone cancer) I had a lot of trouble doing so. All I wanted is one copy and no more. Could you cancell the other orders. I bought your DVD totorial about a month and a half ago but I still did not received it yet and it appears on my master card . It is maybe a mistake but I would want to receive it because I find it very interesting. Last night i ordered around midnight your DVD but i did not know if the order went throught so this morning when i wake up i passed another order to make sure that the order went through correctly. Would you please cancel the order of this morning if that one went through. Because I need only one and not 2 of them. »»Thank you very much and next time i will pay more attention because i am French and sometimes it is not that easy to understand what we should do. Thank again. Great stuff! I love it! I tried some of the basic things myself but I alwasy seem to have the trace of my shadow (me). How do you get rid of or avoid the trace of your shadow? Thanks! Meen you are just too much, i cant just decribe you keep up the good work. Evan, the link to amazon for fairy lights showing product unavailable and they don’t know if they will get more. Thought you should know. Any idea where else I can look for these? Thanks! Hello there, I do believe your web site may be having browser compatibility problems. Whenever I look at your website in Safari, it looks fine however when opening in IE, it’s got some overlapping issues. I just wanted to give you a quick heads up! Other than that, great site! You have one of the most helpful sites covering a wide range of photography that is a starting point for many beginning photographers. Your eBook covers so much, I really enjoy the light painting section. 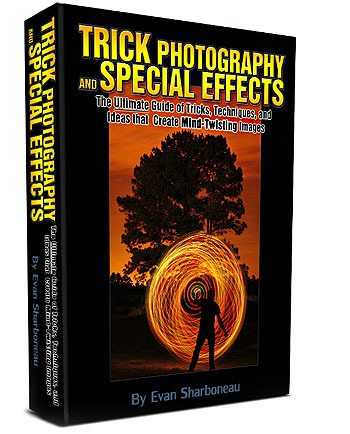 Your eBook + videos cover light painting so well. It is comprehensive and so many useful tips you give are amazing. It is great how you go through everything step by step. just love the work you do and I thank you for sharing so much. Thanks for putting together this e-book and videos. It has opened up more creative ideas and brought back the fun in photography for me. I now find more time to play around with the camera and shooting at night is a real fun thing to do. Thanks for all your hard work, the photo KQQL great. the light in the photo is LED on the end of your key chain. Maaaate! haven’t heard much from you lately! Hope to see some new stuff soon! Hi> I’m back after many years of being away from Photography. I purchased your book a couple of years ago- and I can’t find it anymore on my computer. To be honest I haven’t touched my computer or my camera in several years, and now I’m eager to get back to where I was- enjoying clicking.. What should I do in order to get my copy of trcik photography again?